Begun, the DC food truck wars have? 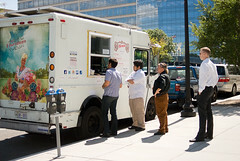 With their truck positioned on Farragut Square, El Floridano was serving lunch to DC’s hungry masses when, they contend, the Golden Triangle BID ambassadors working in the park turned the sprinklers on their customers. TBD talked with Golden Triangle’s executive director, who says that’s not quite how it went down. Our emails and calls to Golden Triangle were not immediately returned. We have reached out to both sides for comment, but it being Friday afternoon, none has come. Were you there this afternoon? Did you see what happened? I was at Farragut on Friday, on the other side of the park. I did see sprinklers going, but it didn’t look like they were particularly close to Floridano’s line. But I was there around 12:30-1pm, maybe there were other sprinklers on earlier that had been turned off by that point. I was seriously considering running around in those sprinklers. It was damn hot. I also saw the sprinklers at 1pm, but didn’t think they were close to any of the many trucks parked around the square. Were there other sprinkler hoses set up near the Floridiano line before then?